See the full gallery of Specialty Carts HERE. Topper Industrial promotes specialty carts in new product photo of Custom Delivery Fan Cart. Topper often designs and build material handling equipment for an end user’s specific needs. The pictured example of the custom fan cart is a great example of this. This cart is designed to be a manual push cart. There is no tow package and it utilizes a standard brake. This is a 4 wheel static cart with a base measurements of 40 x 70. It is equipped with 8×2 phenolic wheels. 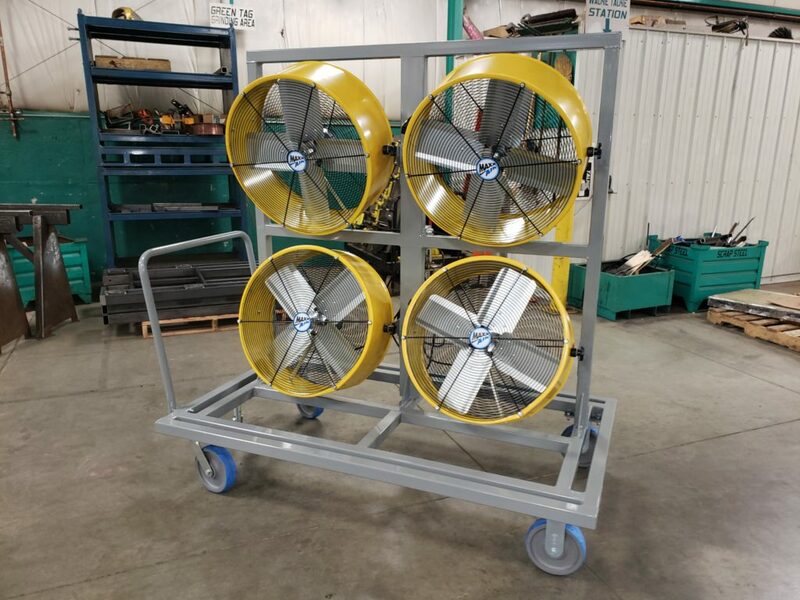 This cart wa designed to carry four moveable fans in its upper framework. This cart was designed as a solution to a company’s need to use as a component to cool parts along their material movement line.